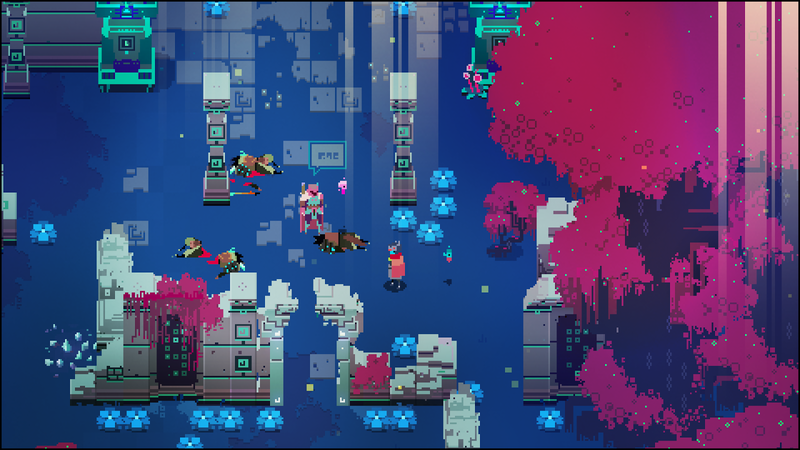 It’s no faint praise for a game to be compared to the early Legend of Zelda titles, but there is no easier way to express the feel and mechanics of Heart Machine’s indie masterpiece Hyper Light Drifter. This is a top down action RPG which values skill and exploration, managing to evoke the same sense of wonder and heroic duty that the Zelda series has been so instrumental in pioneering. Where Zelda wowed audiences with world size and graphical fidelity at the time, Hyper Light Drifter rides on an effervescent sense of style both mechanically and graphically that sets it apart from other games of its kind. With a tight game engine, challenging difficulty, voluminous game world and a compelling yet esoteric story, Hyper Light Drifter stands as one of the best indie action games available on PS4. Hyper Light Drifter is a semi-open world top down action game reminiscent of the SNES era. 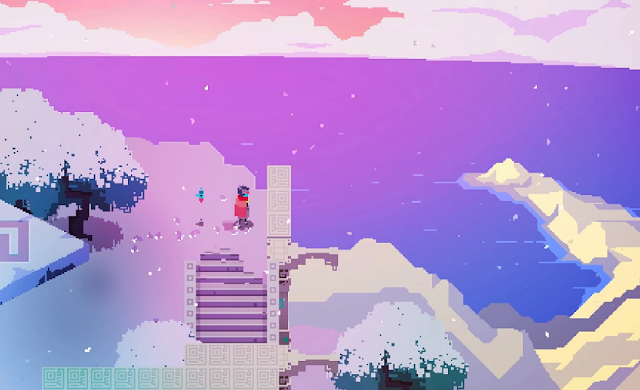 I’m going to try and not make this review a comparison study between Hyper Light Drifter and A Link to the Past, but there will be times where making these parallels really highlight the strengths of Hyper Light Drifter in an easily quantifiable way. 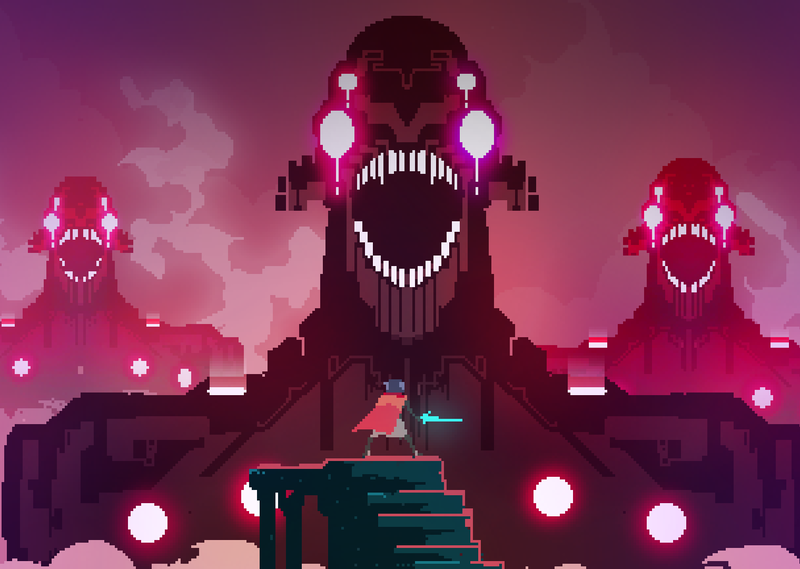 Hyper Light Drifter is definitely the type of game that retro enthusiasts look for when they seek modern reinterpretations of the classics – Heart Machine is adept at taking inspiration from the classics without blatant imitation, creating a game with its own unique identity that manages to still extract a comfortable familiarity in the hands of a veteran player. The key pillars of Hyper Light Drifter are exploration, problem solving and combat. You start off with a quick tutorial (after an intro movie that raises way more questions than it answers) before being dropped off context-free into a quaint little town. The tutorial is basic and doesn’t teach you everything, but this is very intentional: Hyper Light Drifter uses symbolism at every opportunity from the wordless expressionistic plotline to the basic mechanics and controls. From the hub town you can go in any of the compass directions, leading you down a path full of danger and reward. There are tons of side paths that offer small rewards upon completion as well, with clever level design that minimises needless backtracking. You play as an eponymous Drifter, a silent hero who travels around the land alone and he certainly has a lot of problems that need solving. The Drifter clearly evokes the 80’s anime archetype of the silent wandering hero, popularised by Fist of the North Star or Vampire Hunter D: stories about powerful and benevolent heroes parsing through hostile post-apocalyptic landscapes defending the remaining good in the world. 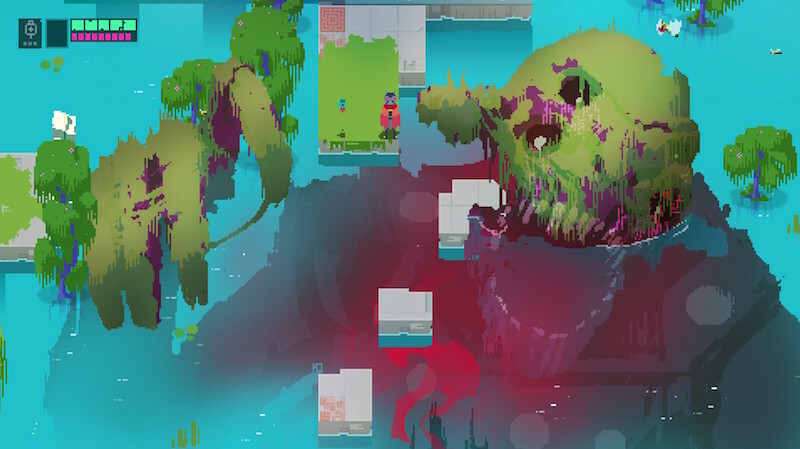 Hyper Light Drifter’s protagonist also suffers from a terminal illness, denoted by occasional distortions of the game world in which he coughs bright pink blood, and the story is framed by a quest to find a cure for his condition. Despite the colourful world, the tone is at best wistful and at worst oppressive – an optimistic tale, this is not. The problem solving and combat pillars are actually very closely intertwined with each other. Rather than stop momentum and task players with a traditional puzzle, Hyper Light Drifter prefers to throw problems at the player by means of combat. In this game, everything is trying to kill you. And they really try too – they don’t bounce around and hurt you if they accidentally bump into you; they will charge at you, jump on you, slash at you, shoot at you and much more. The important commonality is that each enemy is proactive, which means it’s always the game acting upon the player and never the player acting upon the game. This creates an atmosphere where everything feels hostile, meaning that a gauntlet of tough enemies becomes a real time puzzle that impedes your forward progress. As for the combat itself, playing as the Drifter is actually quite an empowering experience. He has both a sword and a gun, the latter of which recharges bullets upon successful strikes with the former. Both of these have quick and responsive animations, but just enough frames that an improper sword strike leaves you open to enemy attacks. You unlock a variety of sword techniques and gun types as you progress through the game, and each upgrade is unique enough that it changes the way you approach combat. The most important mechanic for both exploration and combat however is a dash, or flash step. This isn’t a mechanic unique to this game, but Hyper Light Drifter integrates it into so much of its design that it feels second nature. Dashing allows you to traverse gaps without falling, it allows you to dodge enemy attacks quickly and move into position for a counterattack. The dash makes combat frenetic and because the player gets the opportunity to dodge any attack that comes at them, Heart Machine ramps up the difficulty far higher than your average action game. Like Zelda, game progression is largely tied to items and upgrades which allow you to interact with the world around you in more ways. Unlike Zelda though, or at least modern Zelda, upgrades and new items aren’t there as glorified keys to unlock doors. Most of the upgrades directly affect your combat – making your attacks and shots stronger and behave in different ways. This means that Heart Machine can make progression gates a little differently to most nonlinear exploration games: enemy encounters that are too difficult to overcome without gear upgrades, but can be defeated to unlock sequence breaking if players are incredibly skilled. It’s a very elegant solution which makes every upgrade feel useful and valuable, and the player doesn’t need to grind to achieve them. That’s another thing I love in Hyper Light Drifter. Currency is not dropped by enemies; instead it’s hidden in far off locations and behind enemy encounters. There is a very small amount of currency in the game at any given point, and you earn more of it by being an efficient explorer. If you think a gauntlet of enemies is too difficult for you to advance, you’re free to take a different path, advance to a different place in the map and hopefully pick up enough currency to upgrade your weapons so you can overcome your original obstacle. The important thing to note here is that you’re always going to be experiencing new content for the first time. Hyper Light Drifter is an adventure game with an exploration uptime of near 100%. You’re always on the move, searching for something new. 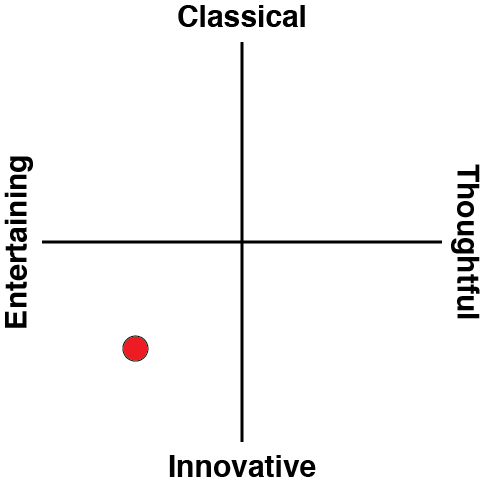 It perfectly matches the thematic nature of the game and feels amazing to play as well. Heart Machine also rewards exploration via more intangible means; through snippets of art which tell the game’s story, as well as immersive backgrounds and environments that will make your jaw drop. Hyper Light Drifter is developed using Game Maker Studio, but the developer really shows off the power of the platform, creating smooth sprites that could put most SNES games to shame. 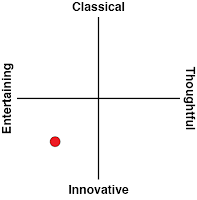 Sound design is also excellent, and while most of the music is ambient it does match the game’s solemn tone consistently. The longer you play the more clear it becomes that Hyper Light Drifter is a passion project – it keeps finding new ways to delight and excite the player and never seems to lose steam or grow stale. Each subsequent boss brings new ideas to the table which illustrates the developer’s clear love for the genre and for gaming as a whole. The entire narrative becomes more poignant when considering that the game is partly autobiographical, where the protagonist’s condition and the hostile nature of the game’s world are reflections of the real world developer’s experience with chronic illness. Players will develop empathy to the Drifter as they play, even if they have trouble understanding the story which is told completely wordlessly. Cutscenes reveal a little information about the game’s world, and so do the NPC’s, some of which display images vaguely depicting the game’s backstory. It’s all a bit arty and hard to understand, which suits the game’s tone but might be disorientating for players who are accustomed to having the story handed to them. Hyper Light Drifter is a wonderful combination of good game design and enchanting aesthetic direction. With solid gameplay backed up by slick production values and a theme of heroism and self sacrifice that runs deep through the entire runtime, this is a game which enriches any player lucky enough to spend time with it. Enter with zero expectations, slowly feel yourself become a master, and rightfully applaud Heart Machine once you have finished.